Peterborough Sports with the UCL Premier Division trophy. Spalding United sharpshooter Bradley Wells warmed up for a huge play-off match with a hat-trick in a 3-1 win over Northwich Victoria today (April 22). 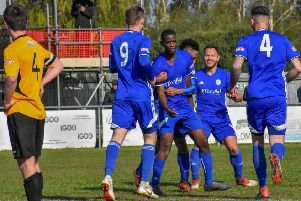 The Tulips are next in action on Tuesday (April 25) when hosting Stocksbridge Park Steels in a one-legged play-off semi-final in Division One South of the Evo Stik Northern League at the Sir Halley Stewart Field. Spalding have finished third and are now just two wins away from promotion. Hot favourites Witton Albion entertain AFC Rushden & Diamonds in the other semi-final. Only one of the four teams win promotion. Champions Shaw Lane completed their league programme with a 3-1 win over Stamford AFC. The Daniels finished 16th. Peterborough Sports will be competing at Stamsford’s level next season and they could well be a team to fear. They’ve raced away with the United Counties Premier Division and today they collected their trophy in an official presentation at PSL before romping to a 4-0 win over Eynesbury to make it 35 wins in 41 outings. Eynesbury were the last team to beat Sports in a league match back in October, but they were beaten before the interval here. Josh Moreman, Avelino Vieira, Josh Sanders and Jordan MacLeod netted before the break as Sports reached 199 goals in all competitions this season. Second-placed Deeping Rangers were beaten 2-1 at Desborough who could still pip Yaxley for third place. Yaxley drew 1-1 at home to Wellingborough Town today thanks to a Matt Sparrow equaliser. The Cuckoos need to beat ON Chenecks in their final game at In2itive Park next Saturday (April 29) to seal the best finish in the club’s history. Wisbech Town are finishing the season strongly. Goals from Billy Smith, Alex Beck and an opposition player saw them come from behind to win 3-1 at Sileby Rangers to make it six wins in a row for the sixth-placed team. Holbeach United bounced back from a mauling at the hands of Wisbech to win 5-1 at Peterborough Northern Star with Zak Munton and Josh Ford both netting twice. That’s back-to-back 5-1 defeats for Star who had led through a Jake Mason strike against a side managed by their former boss Seb Hayes. Max Matless scored a quality goal to give March Town United an excellent point from a 1-1 home draw with Thurlow Nunn Eastern Counties Division One leaders Stowmarket. Spalding Utd 3 (Wells 3), Northwich Victoria 1. Desborough 2, Deeping Rangers 1 (Mooney). Yaxley 1 (Sparrow), Wellingborough Town 1.